Submitted by Alexander Briones on Nov. 3, 2017..
From building guitar and bass amps, Carvin Audio have expanded to stage and recording audio equipment, and this includes the EM900 wireless in-ear monitor system. For the price, it competes directly with other systems that are two to six times more expensive, having features that include automatic scanning and syncing, along with 2 channel mixing for personalized monitor mixes. Other features include PLL (phase lock loop) that helps remove static, LCD display on both the transmitter and receiver and braided cables for reliable use of the receiver pack on stage. Most users are pleased with the Carvin EM900's overall performance, especially when considering its price. Many consider it as the best bang per buck IEM system in the market today, and they recommended it for up-starters who are looking for budget friendly wireless monitoring. Some users also commended its frequency options, making it easier to integrate with any setup. Still many rank it highly considering the quality it provides for the price. John McJunkin at Sound & Video Contractor said, "I will go out on a limb and say that the Carvin EM900 is far and away the best value I’ve ever seen in an IEM system. Unless higher degrees of sophistication are absolutely necessary or unique RF specifications are required, I strongly recommend considering this system. This is the best bang for the buck I’ve ever seen in an IEM". There are some who experienced minor drop outs but were able to correct the issue with adjustments. One user recommended using only the stereo monitoring mode because he experienced sound quality degradation in mono mode. There were also a few who reported that the receiver drains the batteries quickly, and cautions on the need to have extra batteries for long use. 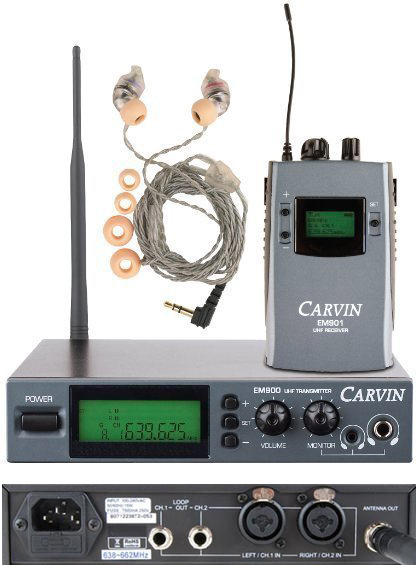 The Carvin Audio EM900 is recommended for those that want affordable personalized in-ear monitoring.